Fig. 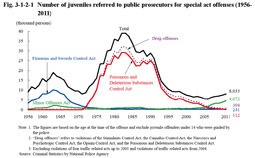 3-1-2-1 shows the number of juveniles referred to public prosecutors for special act offences (excluding violations of traffic related acts (limited to violations of four traffic related acts up to 2003); hereinafter the same in this subsection) since 1956 (See Appendix 3-6 for the number of persons referred to public prosecutors by type of offense). The number peaked at 18,967 in 1963 and then again at 39,062 in 1983, but following which it was on a generally decreasing trend. However, it then constantly increased from 2007, and was 8,033 in 2011 (up 7.4% from the previous year). 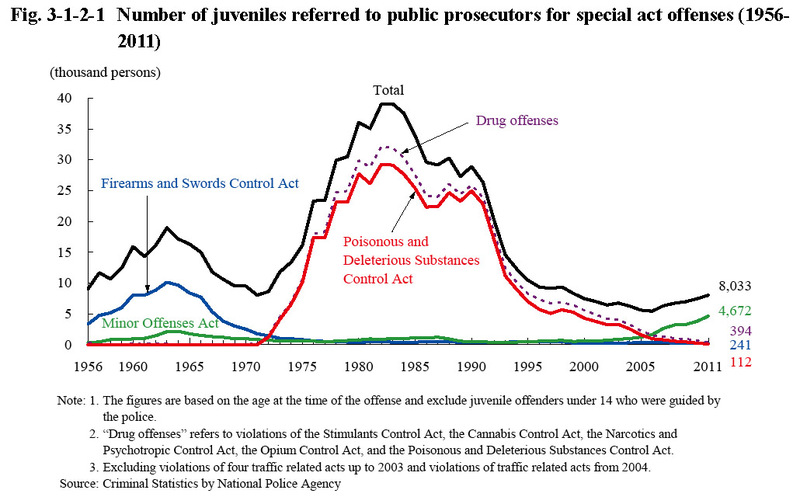 By type of offense, the number was large for Firearms and Swords Control Act violations from 1955 through to around 1969, with the number for drug offenses remaining at a high level from around 1970, but both of which in recent years were on a generally decreasing trend. In contrast to this, the number of persons referred to public prosecutors for Minor Offenses Act violations sharply increased from 2007 and was 4,672 in 2011 (up 22.8% (id. )), and accounted for the highest percentage of special act offenses at 58.2%.